Does this mean that every tube map in the capital is now wrong and needs updating? More importantly, perhaps, does it mean that Rotherhithe station is no longer served by the underground network? 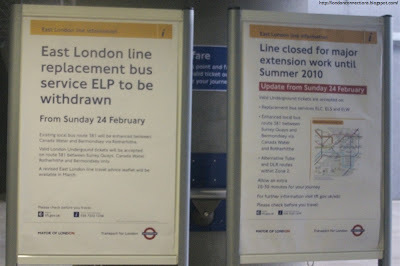 Yes DG, the map on the right poster has a "381" where the ELP was, and the line is white with a black outline (NR style) rather than stripey yellow. The second point's debatable - tube tickets are being accepted on the 381 and it says there's an "enhanced" service, but the lack of yellow on the map may be damning. Ha, yes, I wondered how long that one would last. But damn — I had been planning to go and use it just for the hell of it (I live about 5 minutes walk from both stations) and ask the driver if anyone actually used it. Maybe they could put the money saved towards a north entrance to Canada Water, to make it easier to get there through the housing estate? The prog rock reference is Emerson, Lake & Palmer. Check out their version of Fanfare For the Common Man , probably one of the most famous prog rock track ever made.